Home > Reviews > It's a show that wants to live forever. Prepare to be amazed by this dazzling dance show and magical musical that comes direct from the West End. Just like the characters Fame depicts - all striving to succeed at New York's prestigious High School for the Performing Arts - the young, dynamic artists in this production have come from England's top performing arts schools and boy do they have talent! 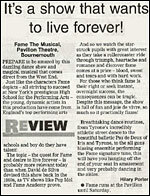 The topic - the quest for Fame and desire to live forever - is probably more relevant today than when David De Silva devised this show back in the 1980's, as TV shows like Pop Idol and Fame Academy prove. And so we watch the starstruck pupils with great interest as they take a rollercoaster ride through triumph, heartache and romance and discover fame comes at a price - blood, sweat and tears and with hard work. For those who think fame is their right or seek instant, overnight success, the consequences can be tragic. Despite this message, the show is full of fun and joie de vivre, so much so it practically fizzes! Breathtaking dance routines, from Tyrone's incredibly athletic street dance to the beautiful balletic Pas de Deux of Iris and Tyrone, to the all guns blazing ensemble performing the Fame signature tune, this will have you hanging off the end of your seat in amazement and very probably dancing in the aisles.